The Holidays are almost here! Wouldn’t you love to have a KitchenAid Mixer to whip up the best cookies and cakes for desserts at the upcoming holidays? 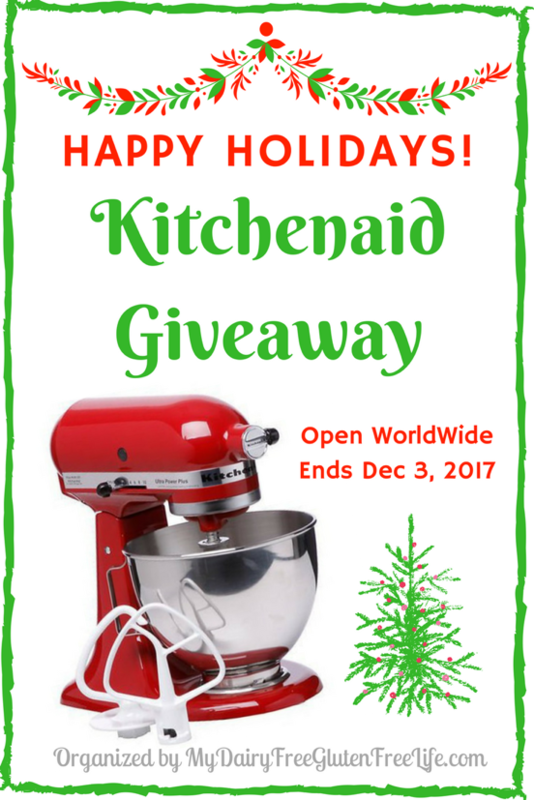 This is a Blogger Sponsored Event which means that the bloggers listed below have donated to cover the cost of this Kitchenaid Ultra Power Stand Mixer for this Holiday Giveaway! Scroll down to enter to win the giveaway!! Tell me in the comments, What would you make first with your new KitchenAid?? Full Belly Sisters, Coupons and Freebies Mom, Crayons and Cravings, Moore or Less Cooking, Budget Earth, Blackberry Babe, Monicarrr, Vegetarian Mama, Scrumptious Moms and This Mama’s Life. One lucky reader will soon be mixing up all kinds of goodies with a Kitchenaid Ultra Power Stand Mixer! The winner will have a selection of colors to choose from, so if you aren’t into red, don’t worry, you can choose your own color! The prize will be available to US only. If the winner is from outside of the US the winner will be paid the cash value of the prize via PayPal. Disclaimer: This blog and any participating blogs did not receive compensation for the published material in this post. No purchase required to enter this giveaway and there is a limit of one entrant per household. Void where prohibited. Odds of winning are determined by the number of valid entries received. Winner will be chosen by Random.org and will be emailed via the email address used to enter the contest. New winner(s) will be chosen if original winner(s) has not responded within 48 hours of email notification. MyDairyFreeGlutenFreeLife is responsible for shipment of prize(s). This giveaway is not administered, sponsored, endorsed by, or associated with Facebook, Twitter, Google, Pinterest or other social media outlet. Disclaimer is posted in accordance with the Federal Trade Commission 10 CFR, Part 255 Guides Concerning the Use of Endorsements and Testimonials in Advertising. I’d love to make so many Christmas goodies! like spiced cranberry scones and bailey’s cheesecake! I’d make some bread since I’ve never used one of these before. I hope it’s easy to make bread. Going to a slbling’s house. I’m spending Christmas at home with my family. My husband and I cook together and we watch our kids open gifts. I’d love to bake your recipe for the Preacher Cake! Looks & sounds delicious! I’m having my son come and visit. We might go see my grandmother. My brother and sister in law just bought their first house a few months ago and they decided that they wanted to host both sides of the family. We can’t wait!! I’m going to my parents’ for Christmas, along with my sibling and his family and my husband’s siblings and their families. White chocolate egg nog cake. My kitchen aid broke I’ve been doing all my baking with a hand mixer. I would spend the weekend making Christmas cookies! I would Love to win the Kitchen Aid Mixer for my 11 year old Daughter who is allergic to tree nuts and wants to be an allergen free baker! Hi I’d love to make some cookies! We’re not doing anything special for Christmas this year. Staying home and spending time with family. I would love to make a hundred Christmas cupcakes to share as we embrace the gifts and fruits of the Hoky Spirit with the children at St Augustine’s Catholic Primary School in Durban, South Africa, it has been a challenging year..the strength my children have given me this year is profound.